The Chinese and the U.S. economies are the two largest in the world. Still, the U.S. remains much larger in terms of GDP Per Capita and Per Capita Disposable Income. 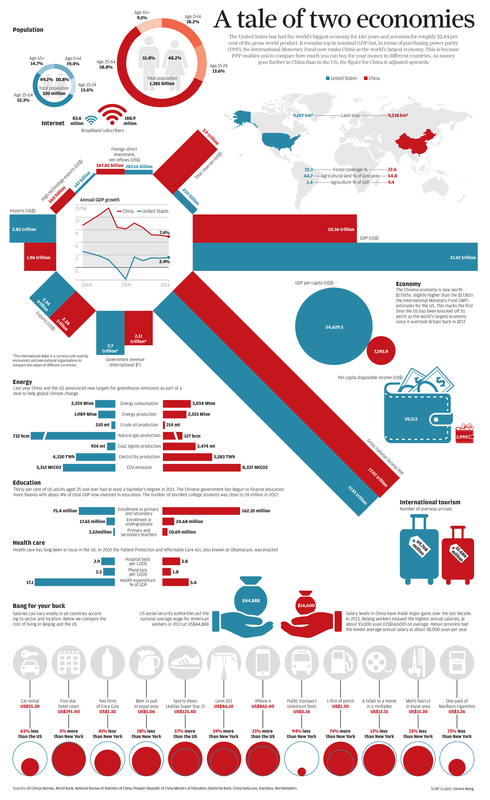 And as the Visual Capitalist points out, the makeup of each economy is totally different. The United States is a sophisticated and highly diversified economy that is based on services, finance, and consumption from the middle class. China has similar aspirations in the future, but right now it is resource-intensive growth engine making the transition from a manufacturing hub to a consumer-driven economy. H/T South China Morning Post via The Visual Capitalist. For a full resolution version of the infographic, click here. Like this article? Share it with a friend! Want more articles like this one? Sign up for the Vintage Value Investing newsletter to get fresh new articles delivered to your email inbox every morning!